Johnson and Countess are currently battling for a backup role to teammate Lamarcus Joyner. As Joyner is playing his first NFL season at free safety and missing some time in the preseason, the role could lead to more opportunities. Currently, through three preseason games, both Johnson and Christian are deadlocked as the ninth-overall graded safety with 83.3 a piece, respectively. Currently, Countess averages ten tackle attempts in between missed tackles with one missed tackle overall in the passing game, whereas, Johnson averages 4.5 tackle attempts in between missed tackles with two missed tackles (one run game, one pass game). Darrell Williams, LT – Backup left tackle Darrell Williams earned an overall game grade of 76.1 against the Chargers, which ranked 16th among tackles for Week 3 of the preseason. He has seen the fourth-most pass-blocking snaps and has allowed only two pressures this preseason for a pass-blocking efficiency of 98.3 (fifth out of 67 tackles). Williams’ pass-blocking grade through three preseason games is at 80.9, which ranks third among all tackles while having 20 and 56 more pass blocking snaps than the two players ahead of him. Cassanova McKinzy, ED- After playing only one snap in preseason in 2016, outside linebacker Cassanova McKinzy has been the most versatile edge defender for the Rams this preseason. His 79.8 game grade ranked 41st among all edge defenders. Through the first three preseason games, McKinzy leads or is tied for the team lead among outside linebackers in defensive stops (four), quarterback hurries (two), targets in coverage (four), and yards per coverage snap allowed with 0.68. Casey Sayles, DI- Undrafted free agent Casey Sayles was the 20th overall interior defender in Week 3 of the preseason with an 82.4. His presence was felt when he blew up two run plays on the same drive to generate two stops across. His two stops across 11 run plays resulted in a stop percentage of 18.2, which was tied for 15th among 115 interior defenders. Sayles is currently the Rams’ highest graded interior defender in the preseason with an 80.4. 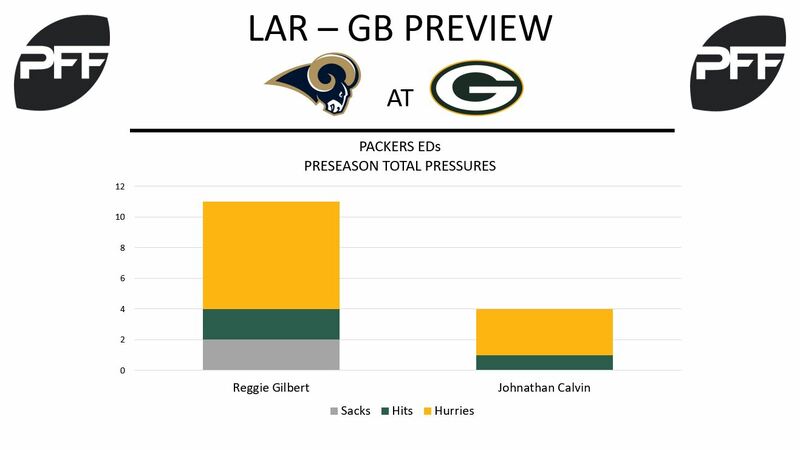 With injuries hitting a handful of the Packers’ outside linebackers this preseason, Gilbert has an opportunity to stick to the 53-man roster. He has been the team’s top-graded edge defender in every preseason game, and he hasn’t earned a PFF grade lower than 80.5 during that span. His 11 total pressures rank fourth among all edge defenders. His pass-rushing productivity of 13.2 against the Broncos ranked 10th for 3-4 outside linebackers. Calvin has applied four pressures in 47 pass rush snaps this preseason, while earning a run-stop percentage of 6.9. His PFF overall grade of 74.7 against the Broncos this past week ranked 90th among edge defenders. Taysom Hill, QB – Hill, who didn’t take a snap last week, is in the running to unseat Joe Callahan to be the team’s No. 3 quarterback. The undrafted free agent out of Brigham Young University has an adjusted completion percentage of 73.3 this preseason. Most of his success comes when he throws the ball in 2.5 seconds or less. In that time frame, he’s completed 7 of 10 passes for a touchdown and a passer rating of 115.8. Conversely, he’s completed 3 of 6 passes with a passer rating of 88.9 when he throws in 2.6 seconds or later. 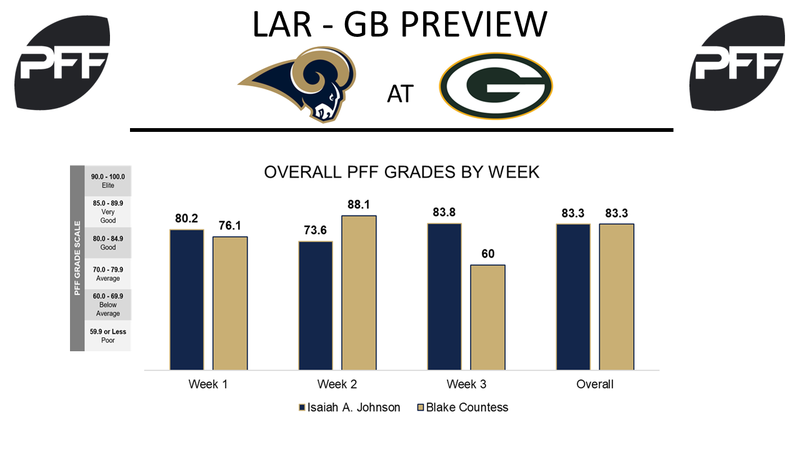 Ladarius Gunter, CB – Gunter’s PFF overall grade of 41.9 last season ranked 97th among qualifying cornerbacks. This year, he’s fighting for a roster spot after starting nearly every game of 2016. He hasn’t allowed a catch on four passes thrown into his coverage this preseason. His grades of 82.9 in Week 1 and 83.9 in Week 2 of the preseason ranked eighth and ninth, respectively, for his position. Christian Ringo, DI – Ringo continued his solid preseason against the Broncos, earning a PFF overall grade of 83.8. He posted a 28.6 run-stop percentage in the match up, which ranked third among 3-4 defensive ends. He enters this week with a 10.0 run-stop percentage and a pass rush productivity of 7.5.